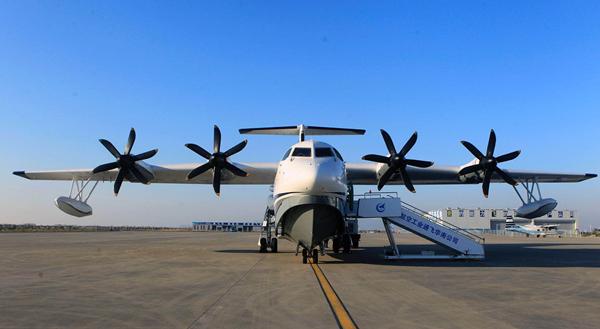 Four large AG600 amphibious test planes will be built in order to shorten examination times for airworthiness certification by civil aviation authorities, according Aviation Industry Corp of China (AVIC). Assembled by China Aviation Industry General Aircraft (CAIGA) in Zhuhai Aviation Industrial Park of Jinwan District, the first of the world's largest amphibious aircraft rolled off the assembly line in July 2016. 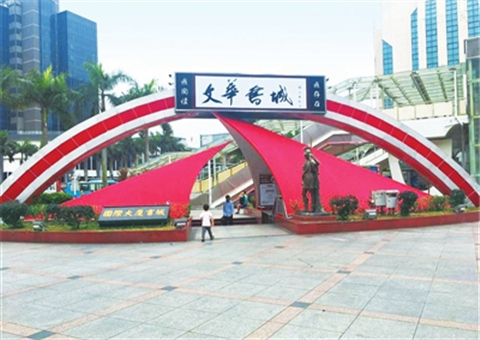 It is still undergoing review and certification, which are crucial steps for the model to start playing roles in emergency rescue and natural disaster prevention. 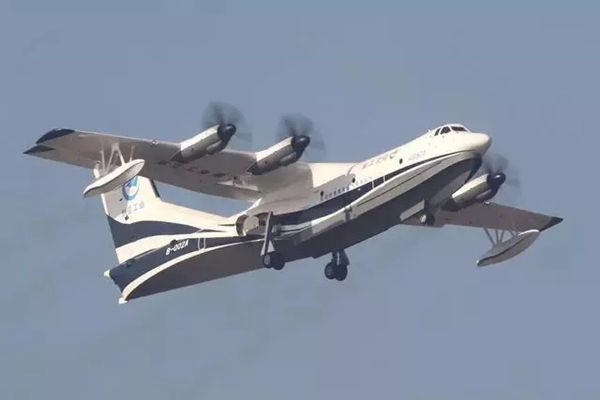 Trials concerning stalling characteristics, hydrodynamics, and flight envelope extension have continued since the seaplane made its water-based flight from the Zhanghe Reservoir in Hubei Province last October. 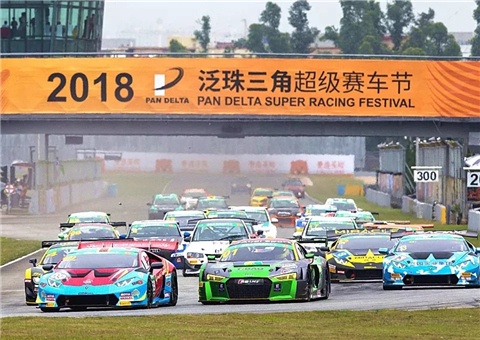 The second stage of test flights is to be conducted before the end of this year, according to Zhou Guoqiang, spokesman for the State-owned aviation conglomerate, which is headquartered in Beijing. China's homegrown AG600 took its maiden land-based flight in December 2017 in Zhuhai. 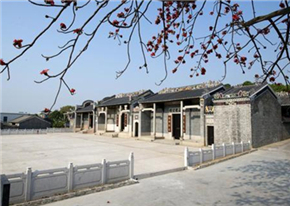 The craft is codenamed Kunlong, Kun referring to a legendary big fish that morphed into a large bird that could fly 90,000 miles high and far, and Long, meaning dragon. It is designed to fight forest fires and conduct water rescues. The design team will optimize the structure and systems to tap the aircraft’s potential, according to AVIC. Specifically, they will improve designs of the aircraft's maximum take-off weight of 53.5 tons, install pressure cabins, and improve firefighting and emergency rescue systems. According to the plan, fabrication of parts will start this year. Training of test pilots for this improved design will begin at the same time. The AG600 is a milestone in China's large-aircraft industry, joining transport aircraft Xi'an Y-20 and passenger jet C919. It can carry out operations in adverse weather conditions with 2-m waves. It also can hold 50 people with a cruising speed 10 times that of salvage ships and is ideal for open-sea water rescue. 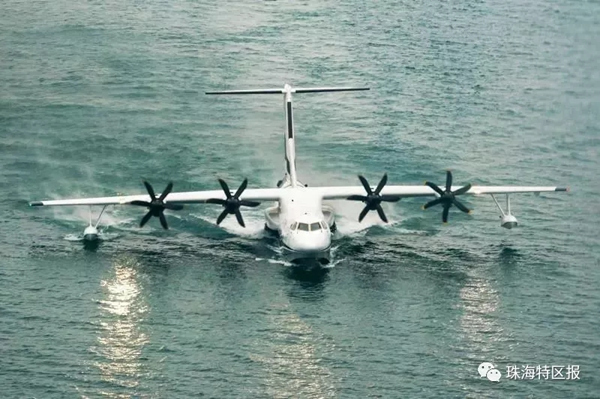 After trial ground flights in Zhuhai, the China-developed AG600 large amphibious aircraft landed at Zhanghe Airport in Jingmen of Hubei Province on Aug 26 to prepare for its first water takeoff. The world's largest amphibious aircraft, AG600, carried out its first takeoff and landing on waters in Hubei province's Jingmen on Saturday.